Indeed A Delight, under jockey Dusty Shepherd, defeated Db Captain King in Sunday's Rainbow Juvenile Invitational at Ruidoso Downs. RUIDOSO, NM�JULY 21, 2013�Indeed A Delight broke her maiden and improved her record to 1-1-1 in four starts Sunday with a win in the $50,000 Rainbow Juvenile Invitational at Ruidoso Downs Sunday afternoon. Racing for her breeder Eaves Family Horses Limited Partnership, Indeed A Delight was previously second in her Ruidoso Futurity(G1) trial and third in her Rainbow Futurity(G1) trial. Ridden by Dusty Shepherd for trainer Todd W. Fincher she completed the 400 yards in :19.628 seconds, a 94 speed index into a 5 mph headwind. She earned $25,512 for the victory. Indeed A Delight is a Texas-bred filly by world champion WAVE CARVER from the Six Fortunes mare Fortune Of Delight. 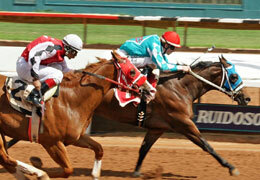 She is expected to make her next start in the $2.6 million All American Futurity(G1) trials in mid-August. Dude Biggs homebred Db Captain King finished a neck back to earn $10,204 for second. Jackie Riddle conditions with Jose Alvarez riding. Jaime Aldavaz saddled The Zapta to a third place finish for Felipe Flores, Sr. Ridden by Roberto Valero the bay earned $5,102 for the effort. Post-time favorite Cr Tuckermuck finished fourth after being forced out at the 1/16th pole and had to steady. Separate Fly was disqualified from 5th and placed 8th for interference. Completing the field were Crios, Unveil, Ellas Cartel, Streakin Mr Jess and Separate Fly.